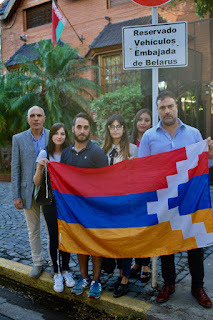 The Armenian National Committee of South America delivered a letter to the Ambassador of Belarus in Argentina in protest for the decision to extradite the Israeli blogger Alexander Lapshin to Azerbaijan. "We wish to convey our most sincere concern over the decision of the Republic of Belarus to grant the extradition of the digital journalist Alexander Lapshin to the Republic of Azerbaijan," said the letter signed by the Armenian National Committee of South America and Armenian Youth Federation of South America. "Due to his trip to Nagorno-Karabakh in 2012 he was included in the 'blacklist' made by the Azerbaijani Foreign Ministry. Subsequently, he was accused of violating two clauses of Azerbaijan's criminal law 281.2, which punishes those who damage the territorial integrity of that country, and 318.2 that prohibits crossing Azeri borders without the required documents. Both laws have prison terms of up to eight years." "As Argentine citizens descendants of Armenians we need to transmit you that we consider extremely dangerous for Lapshin to be handed over to the Azerbaijan authorities, and we hope to be able to arrange a meeting as soon as possible so that we can discuss the matter," finished the text.